Enter to win P.J. Fitzpatrick’s $5,000 Home Improvement Sweepstakes. We’ll choose one lucky final prize winner as well as two monthly winners for other prizes and giveaways. Select all areas you want to improve in your home. By providing the above information I authorize P.J. Fitzpatrick to contact me regarding a free in home estimate, even if I am on the National or Local Do Not Call List. My information will not be used for any other purpose. No purchase necessary to participate in this promotion, and you do not have to submit to a sales presentation. Must be a homeowner in our service area and over 21 years old. Monthly winners do not qualify for future monthly drawings but are still eligible to win final prize. Final prize winners are not eligible to win another prize. 2. Eligibility. Subject to additional restrictions below, the P.J. Fitzpatrick’s Home Improvement Sweepstakes (Sweepstakes, the word sweepstakes and Home Improvement Sweepstakes are considered the same thing from here on in this document) Home Improvement Sweepstakes is open to residents of New Castle County DE, Kent County DE, Sussex County DE, Delaware County PA, Chester County PA, Montgomery County PA, Philadelphia County PA, Bucks County PA, Cecil County MD, Salem County NJ, Gloucester County NJ, Camden County NJ and Burlington County NJ who are 21 years or older at the time of entry and who own their own home. Commercial structures are not eligible, one entry per household. Employees of PJ FITZPATRICK, INC Company (“Sponsor”), and any affiliated companies, subsidiaries, and advertising or promotional agencies, and the immediate family members of, and any persons domiciled with, such employees, are not eligible to enter or win. 3. Entry. The Sweepstakes will begin at 12:00 a.m. (E.T.) on Monday, April 1, 2019 and will run through 11:59 p.m. Sunday, June 30, 2019 (the “Sweepstakes Period”) with a monthly drawing on the 1st of each month and final drawing for 5,000 on July 1, 2019. (1) To enter online, visit the PJ Fitzpatrick Home Improvement Sweepstakes official registration page, complete all of the required information and submit your entry by clicking on the ” Submit” button. All entries must be received before 11:59 p.m. the day before the monthly of the drawing date in order to be eligible. If you are the monthly winner your name will stay in the sweepstakes for the drawing until June 30, 2019 but you are not eligible to be a monthly winner for the duration of the Home Improvement Sweepstakes. Your computer must accept cookies, or any successor or similar technology, which may be used for the purpose of entry tracking. Ad blocking software on your computer needs to be disabled so it does not interfere with processing your entry. By entering, you agree to the terms of these Official Rules and to receive emails and/or phone calls from Sponsor or those directed by Sponsor. You can opt-out of the receipt of such emails by following the directions in any email received from Sponsor. Sponsor will not be responsible for incomplete, lost, late, misdirected or illegible entries or for failure to receive entries due to transmission failures or technical failures of any kind, including, without limitation, malfunctioning of any network, hardware or software, whether originating with sender or Sponsor. In the event of a dispute, all email entries will be deemed to have been submitted by the owner of the email account from which they were sent. For these purposes, an email account holder shall mean the natural person assigned to such email account by the Internet access provider, online service provider or other organization responsible for assigning email addresses for the domain associated with such email account. All entries become property of Sponsor and none will be returned. Any questions regarding the number of entries submitted or the owner of an email account shall be determined by Sponsor in its sole, reasonable discretion, and Sponsor reserves the right to disqualify any entries by persons determined to be tampering with or abusing any aspect of the Sweepstakes. 4. Prizes. Winners will be selected in a random drawing from among all eligible entries to be held on or about May 1, 2019 for the various gift card or ticket monthly winner. The winner will be drawn on July 1, 2019, and will receive up to $5,000 retail value in PJ Fitzpatrick, Inc replacement home improvement product(s) of your choice (replacement of existing home improvement product and no new construction or carpentry). Prize must be claimed within 5 days of initial call or email from PJ Fitzpatrick, Inc. and work selection must occur within 60 days of the end of the Sweepstakes. Only products of PJ Fitzpatrick, Inc. or its subsidiaries will be awarded. No cash or credit will be awarded. All PJ Fitzpatrick, Inc. products are professionally installed by PJ Fitzpatrick, Inc employees and are backed by warranty. 5. Winner Notification and Acceptance. The winner will be notified by telephone and/or email on or about the drawing dates mentioned in “4.Prizes”. Failure to reach Winner by phone and/or email may result in disqualification of Winner, forfeiture of his or her interest in all prizes and possible selection of a substitute winner. Return of prize notification as undeliverable may result in disqualification and an alternate winner may be selected. Winners may waive their right to receive a prize. Prizes are non-assignable and nontransferable. No substitutions allowed, except that prizes and individual components of prize packages are subject to availability and Sponsor reserves the right to substitute prizes of equal or greater value. Winners are solely responsible for reporting and payment of any taxes on prizes. Winners may be required to complete an affidavit of eligibility, and a liability and publicity release (except where prohibited by law) which must be returned prior to receipt of prize. Failure to complete, sign and return the affidavit or release, or to comply with any term or condition of these Official Rules, may, at the sole discretion of Sponsor, result in a winner’s disqualification, the forfeiture of his or her interest in the prize, and the award of prize to an alternate winner. Except where prohibited, acceptance of any prize constitutes Winner consent to the publication of his or her name, image and /or video in any media for any commercial or promotional purpose, without limitation the Internet or further compensation. 6. Participation. By participating, entrants agree to be bound by these Official Rules and the decisions of Sponsor. Sponsor reserves the right to disqualify persons found tampering with or otherwise abusing any aspect of this Sweepstakes as solely determined by Sponsor. In the event the Sweepstakes is compromised by a virus, non-authorized human intervention, tampering or other causes beyond the reasonable control of Sponsor which corrupts or impairs the administration, security, fairness or proper operation of the Sweepstakes, Sponsor reserves the right in its sole discretion to suspend, modify or terminate the Sweepstakes. Should the Sweepstakes be terminated prior to the stated expiration date, Sponsor reserves the right to award prizes based on the entries received before the termination date. 7. Limitations of Liability. By entering the Sweepstakes, entrant agrees that (1) any and all disputes, claims, and causes of action arising out of or in connection with the Sweepstakes, or any prizes awarded, shall be resolved individually without resort to any form of class action; (2) any claims, judgments and awards shall be limited to actual out-of-pocket costs incurred, including costs associated with entering the Sweepstakes, but in no event attorneys’ fees; and (3) under no circumstances will any entrant be permitted to obtain any award for, and entrant hereby waives all rights to claim, punitive, incidental or consequential damages and any and all rights to have damages multiplied or otherwise increased and any other damages, other than damages for actual out-of-pocket expenses. 8. Construction. All issues and questions concerning the construction, validity, interpretation and enforceability of these Official Rules, or the rights and obligations of any participant and Sponsor, shall be governed by and construed in accordance with the laws of the State of Delaware, without giving effect to any choice of law or conflict of law rules or provisions. The invalidity or unenforceability of any provision of these rules shall not affect the invalidity or unenforceability of any other provision. In the event that any such provision is determined to be invalid or otherwise unenforceable, these rules shall be construed in accordance with their terms as if the invalid or unenforceable provision was not contained therein. 9. General Release. By participating in the Sweepstakes, entrants release PJ FITZPATRICK, Inc., any other promotional sponsors, and each of their respective affiliated companies, directors, officers, employees, representatives, partners and agents from any liability whatsoever for any claims, costs, injuries, losses or damages of any kind arising out of or in connection with the Sweepstakes or with the acceptance, possession or use of any prize (including, without limitation, claims, costs, injuries, losses or damages related to personal injuries, death, damage to, loss or destruction of property, rights of publicity or privacy, defamation or portrayal in a false light). 10. Sponsor. P.J. 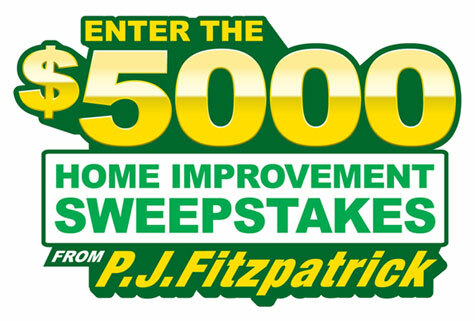 Fitzpatrick’s $5,000 PJ Fitzpatrick Home Improvement Sweepstakes sponsored by PJ FITZPATRICK, Inc, whose decisions regarding the selection of winners and all other aspects of the Sweepstakes shall be final and binding in all respects. Sponsor will not be responsible for typographical, printing or other inadvertent errors in these Official Rules or in other materials relating to the Sweepstakes. If you have any questions regarding this Sweepstakes, please contact PJ FITZPATRICK, Inc. at 302-325-2360.